This website has sponsored the shirts of David Wheeler since his arrival at St James Park in August 2013. With his departure to Queens Park Rangers we’ve been looking to use our funds on one of the new players. 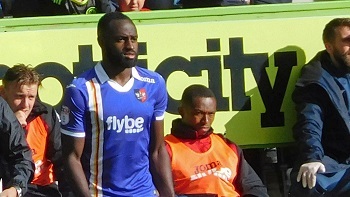 Therefore we’re delighted that Andy Gillard of Exeter City’s commercial department has organised Hiram Boateng for us. Much to most fan’s surprise Hiram Boateng was announced at 5pm on transfer deadline day. 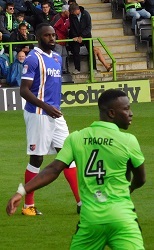 The 21-year-old had been released from Crystal Palace and joined the Grecians on a free transfer. 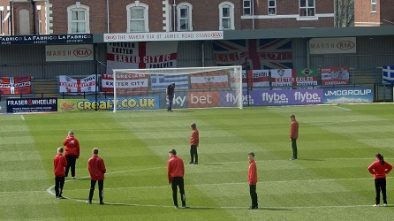 Exeweb.com uses revenue gained from this website and the forums to support Exeter City through various means, such as purchasing the goal nets last season, and providing hospitality for forum users. We were disappointed by the departure of David Wheeler who we had sponsored since has arrival at St James Park. Seeing him progress from that game changing super-sub to goal machine was thrilling. We wish him well for his move to QPR, and thank him for leaving us with so many memories. Transfer day was something different for Exeter City supporters, with so many new players coming to us. The signing of Hiram Boateng was quite a capture and we’re quite proud that Exeweb.com have been given the privilege of sponsoring him. 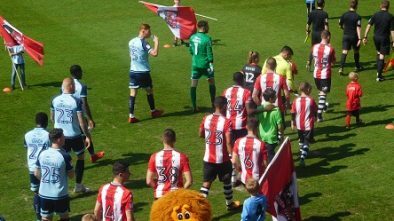 Transfer day was almost unreal and shows that Exeter City have a real intention to get promoted this season. Hiram Boateng will be a key part of the team delivering quality football and great results. We can’t help but be really excited about the coming season and being able to sponsor the shirts of Hiram Boateng is just fantastic, as his performance on Tuesday night at Barnet proved.